Most of us touchdown after a flight hungry, annoyed, hungry, dehydrated, cranky, and hungry. We spend hours waiting in line at security, struggling to untie double knots, struggling to retie double knots, and then eating something horrible and expensive - all before cramming into a tiny, uncomfortable seat, begging for water, and eating something else horrible and expensive. It's pretty much impossible to land without wanting to punch yourself and or someone else in the face. 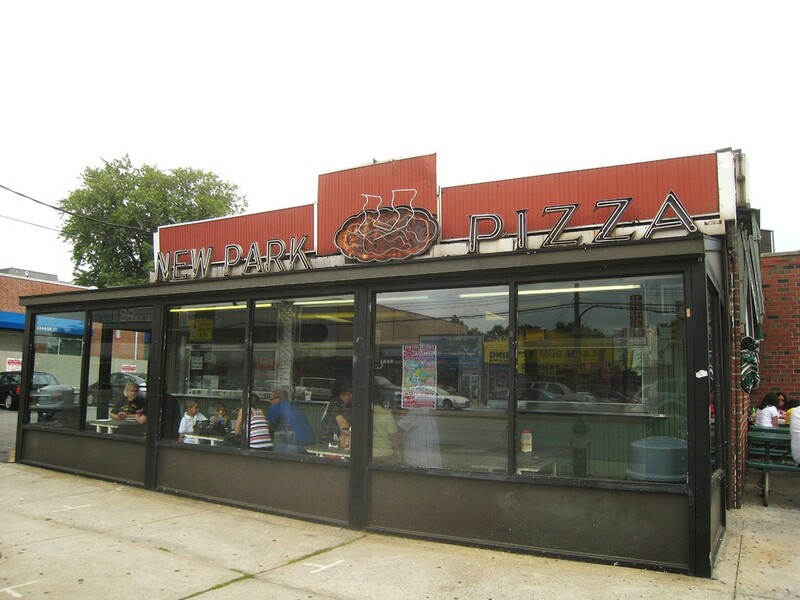 Thankfully, New Park Pizza is only a 12 minute ride from JFK. We don't have the category yet, but pencil this place in as the first (and possibly only) Perfect For On My Way To Or From JFK. New Park is not the premier pizza in the city, and Howard Beach is not the premier place to grab lunch, but when JFK is on your itinerary, it is worth considering a stop. You have to get to the airport 11 hours before your flight these days anyway, so you can afford another 20 minutes for a top-tier slice. The trick out here is to order your pies or slices well done. As in “very well done, black on the bottom, char that sh*t up right.” For some reason, you are allowed the choice of not getting your pizza well done, which is a shame, because anybody who eats a not-crispy slice at New Park probably leaves wondering what the fuss is about. Don't be one of those people. Done right, this pizza will be the best part of your day, unless you win the armrest battle with the person next to you on your flight. Then it'll be the second best part of your day. Well done, please. The toppings are standard, no one a standout above the others, just get what you normally get and you'll be fine. Should note that we pretty much never mess with the square slice here - it's too doughy for what it's worth, and you lose the signature char that makes this place good. These are solid, but even though they often sell out of them, not the reason to swing by. The ricotta-mozzarella mix is good, but the sauce out here is the star. So if you do get a 'zone, be sure to order a bucket of red sauce on the side for dipping. Literally the only other thing on the menu.